Chloroplasts are specialized organelles found in all higher plant cells. These organelles contain the plant cell's chlorophyll, hence provide the green color. They have a double outer membrane. 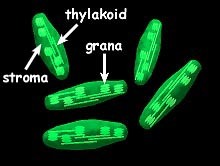 Within the stroma are other membrane structures - the thylakoids and grana (singular = granum) where photosynthesis takes place.